I broke open my Honey Honey fat quarter bundle by Kate Spain. I wanted in order to make a new quilt. It didn't get any easier! I ended up starting 2 quilts. The first one is a version of Oh Baby Oh Baby. So I cut some strips. and sub cut pieced strips. I had these lovely patchwork panals. These are just a few I'm not quite done sewing them together. i.e. work, kids, dinner, laundry, doctor appointments....etc. I still have one jelly roll race quilt to sew for Christmas. I just couldn't stay focused after I opened Honey Honey. yep I finished another Christmas jelly roll race. I used Mama Said Sew by Sweetwater. Today it's freakin' cold and snowing!! anyway, I am putting up Christmas decorations today/tonight. More sewing tomorrow I think. If I get any sewing done.. 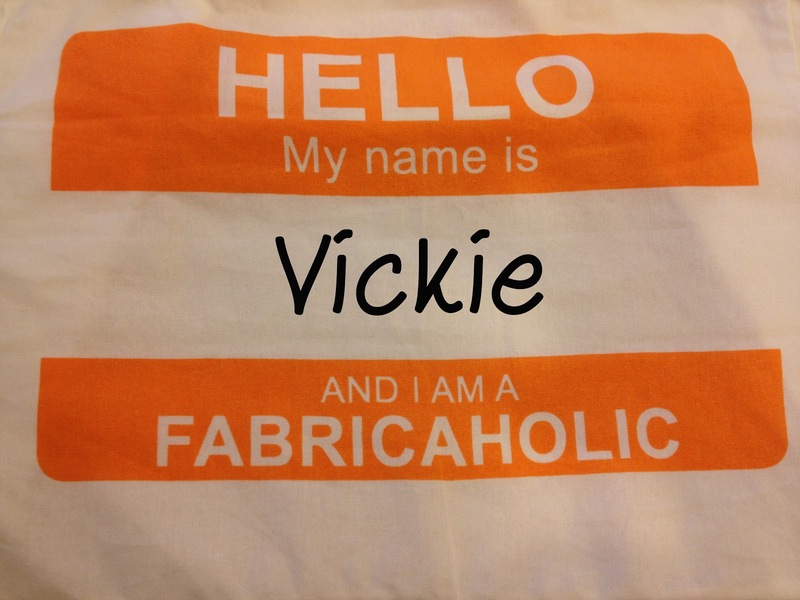 I did a little more sewing today. Between the turkey and side dish preparations that is. It was sunny enough to take some pictures of my quilts outside too . 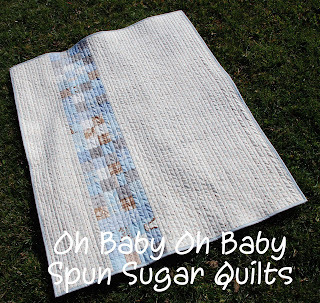 This is the finished Oh Baby Oh Baby quilt. I am thinking of making a bigger quilt in another fabric line like Glamping or Honey Honey. when I will start sewing that. I have one more jelly roll race quilt top to sew. I think it is Heritage by Moda. I hope to finish sewing it this weekend since time is ticking away for the Christmas quilts. Have fun shopping if you are braving the crowds tomorrow (tonight). I am going to one place. A local shoe shop is having 20% off at 7am and I have a gift certificate from my birthday. I see a new pair of Alegria's in my future. The first completed jelly roll race. I sure hope the recipient likes it. I hope they aren't reading my blog! yeah apparently I have 28 quilted items to bind. I decided that I ought to take inventory of how many quilts I had to bind. I realized that there were at least 10 I had put in my closet while I was focusing on my book quilts. and all the jelly roll quilts for Christmas gifts. I still can't believe I have 28. I made 5 on Sunday night. I am pretty sure some of these will be all machine sewn. I just can't imagine I will have time to hand stitch them all. We need a REAL break without driving, flying or staying in hotels. I believe this is a 'stay-cation'. I'm going to try to make the best of it. 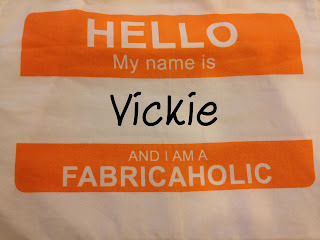 I got a little side tracked on the jelly roll race quilts. I have been working like crazy. I get the pleasure of running the household for a week alone. It was a good trip but I didn't sew a stitch. Today I finished my 5th jelly roll race quilt top. using Nature's Chorus by April Cornell for Moda. I am running out of time on these, wouldn't you know? then I hired another staff member last week. So there are now 7.
not making her a quilt as well. and I have 32 days to do it. 3 quilts are in fact back from my local quilter. I will bind them soon-ish. I plan on posting them as I finish. It's fun to record the 'finishes'. Congratulations on getting your block published in the magazine. The Economy version is my favorite. " I will email you for your information. 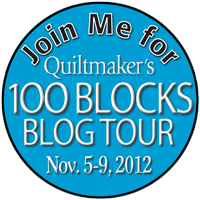 Are you excited for the next issue of Quiltmaker's 100 Blocks? I finally get to share the block I designed. Here's my original layout on point with snowball blocks. I think this block could be alternated with any simple blocks for varying effects. Here it is with an Economy block alternated with it in Kate Spain's Honey Honey fabrics. Hmm I think I am a BIG fan of the P B and J version. 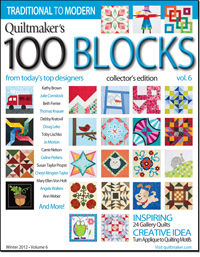 If you'd like to win a copy of Quiltmaker's 100 blocks leave me a comment as to which layout you like best. I will be randomly choosing a winner on November 11th. Quiltmaker will send you the magazine! She's my new custom Blythe 'girl'. Her artist is Cindy Sowers. She does Monster High and Blythe and others. I love the mohair re-root. I have always wanted a mohair girl. Now I want ALL my dolls to have custom faces. I 'might' actually try to matte one of the dolls on my own. I know many of you aren't Blythe collectors but I just had to blog this/share this. I really have THE best friends EVER. so my friends brought it to me! That'd be Stephanie, her sister in-law and Katrina. I gave Stephanie a wish list for market before she left. Sample Spree is pretty crazy. but I was happily wrong. but I am considering adding it permanently. If the shoe fits....as they say. Katrina was cool enough to bring it back to Ohio for me. Again, I felt blessed since I didn't have to pay shipping. They scored Glamping by Mary Jane Butters. Plus there was a little Lecien thrown in there. I have great plans for these. Thanks again to my GREAT friends.